Commentary on current affairs. The literature that runs around us everywhere, unwritten, the songs of bird: mockingbird, sinsonte in Spanish, Soccoro Mockingbird. Etterligne. Sounds, tunes and words that inspire. Reactions that inspire. Sometimes take a U-turn, U-vingsomBolt. To the children cold in death in Houla, Syria and to Assad and Asma, the sky is covered with blood! If you thought that John Paul II was a superstar you have to closely watch Pope Francis today. Did you see him take that cup of traditional Argentinian tea from a person in the audience? Last year he already got a mate gourd and a straw from Cristina Fernandez Kirchner, President of Argentina and he kissed her. She was excited and spoke about this. Who would not be? Nightbird was kissed by John Paul II in her own days. So the that Pope already heard the song of this Nightbird from her own lips. Nightbird used to sing in an orchestra and sang to him more than once- but that is another story. Pope Francis is at ease with selfies and almost all that you can say makes contemporary times and yet he does not cease to reflect the poverty of Francis of Assisi, it seems. What makes some leaders work much harder than others? Pope Francis is fast on the Internet and I am sure he knows that FOMO was Internet slang before it became the not so attractive formal abbreviation to be found even in the Oxford Dictionary. Fear of Missing Out. But is it really fear? John Paul II's first words to the people after his election and knowing fully well that people looked at a Polish man as a stranger to the Papacy were "Do Not Be Afraid!" He stepped out on a different path. Years after John Paul II sent the first e-mail from the Vatican and even earlier, he had told the world that to be missing in the media is not to be anywhere. What is called a very traditional church, apostolic for being founded on the Apostles moves with the change of the times and they do it with originality. What there is to fear is not to be wise and original. Well, most leaders know that there is nothing that makes you get there than beating your own path. If you copy as an artist called Elimo Njau of Kenya has on a big board at Paa Ya Paa, you put God to sleep. 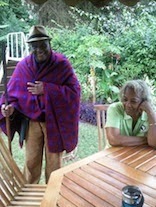 Original is what artist Njau is, he and his wife Philda Njau. He has a new perspective for everything you know! But long before that, you can put God to sleep, you bore everyone else to death. So Pope Francis coming too from a far country like John Paul II has kept his originality alive despite all those dogmas one hears about. And many in the world, it would seem love to find and meet someone who stands for something. Someone who is or was but who sang his song out loud for all to hear. Yes, Pope Francis' virtual life is way up there as his own is so down to earth. Washing feet of the sick on Holy Thursday and last year of a group of prisoners that included a Muslim woman. Headlines blared: Pope washes the feet of a Muslim woman http://www.telegraph.co.uk/news/religion/the-pope/9960168/Pope-washes-feet-of-young-Muslim-woman-prisoner-in-unprecedented-twist-on-Maundy-Thursday.html His tweets @Pntifex_es get worshippers and admirers clicking in faster than the speed of light. And they are little sermons! 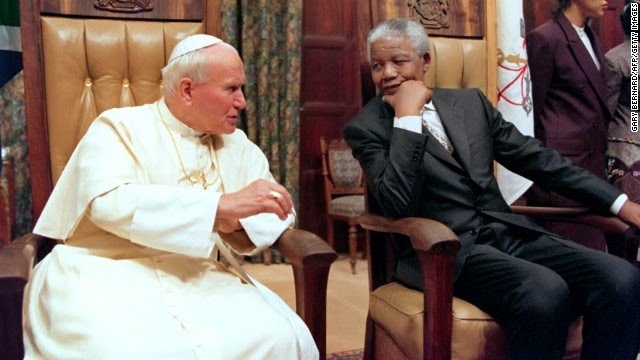 John Paul II (Between the two Popes Benedict XVI who in his own way did the untraditional, what might add up to much more than Tweets and visibility for greatness in the church) was unique in so many ways. Even if he was often called the Pope of Sorrows for he had much suffering in his life, all said when he smiled, it was as if the sun rose. And yet his predecessor was the smiling Pope John Paul I who broke another kind of record, not intentionally of course, dying after a month in office. The smiling Pope was Italian. Polish John Paul II was at first looked down by some for being a man too immersed and only belonging to his country, Poland. There had not been a non-Italian Pope for years before he came along. He astounded his critics by taking the globe by storm not only physically kissing many airports grounds but also revealing a man who espoused a most profound intellectual take on the world. A poet of his times and would have been a great film actor were it not that he chose the robes. He is canonised a saint pronto in April 2014. The call Santo Subito, saint quickly or fast, has been heard by the church in our times, normally it takes years. John XIII who gets canonised along with him, another cheerful man knows that. Yet his process was even faster. There are others that have been lost to memory. But there has been a change in speed on this since John Paul II. Speed. With these few strokes it looks like running on the beaten tracks is not what the Church is doing. Every leader knows that it is best to be cordial with the Pope. Take tea with him if you can. All leaders meet the Popes and the Popes like to meet with them. They only do not go where they are rejected otherwise they want to be everywhere. I remember when Lithuania would not, in the 90s have John Paul II as a guest. Taking a stand even if it conflicts with others and why should there be a chorus in every view is original and it marks one's own path. However, positions that diminish one's moral authority are not viable. They just are not original. To be original in this case means to break barriers. Pope Francis and Fernandez Kirchner differ on gay marriage. They agree on the good treatment of all people regardless of their sexual orientation. Nightbird likes to feed on inspiration. Recently it has come from poet Rabindranath Tagore. One could say that despite the greats, there is a vacuum of leadership in the world. There are racial, ethnic and religious diversities that need management at a positive level. A gush, not a dash of fresh ideas is needed. New people pronouncing them. Most of the secular people in whom we invest hope for the interpretation of meaning are fast failing us. Nightbird does not easily criticise women for it knows the efforts thy make. But sometimes one has to. Differences seem not to have towering figures who speaks to them for healing. The high hopes pegged on Aung San Syu Kyi seem to fail when we think of the killings of the Ruhingya Muslims. She was and remains rather quiet on their deaths. 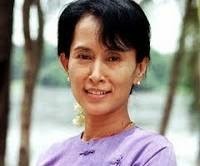 This Syu Kyi could talk about as a Nobel Prize laureate not as a Member of Parliament. I hear that is her dilemma, that she will be marginalised. The Popes cannot say everything about everything to the world. Speak! But are there not times when one has to take the risk of losing a podium one has by throwing in their lot with a people who suffer? Can one not leave fate to decide how one's action will be judged? Nelson Mandela's moral authority would probably have been lost if he had stayed longer than five years as President of South Africa but now he had power until the end, and yes, his death led the world to troop together and the words of leadership there spoken need to be heard again. Yes, there is the Group of Elders that I see often on FB The Eldershttps://www.facebook.com/theElderswith words of inspiration and every village must develop its own leaders, but this is limited and we need to hear strong voices in more channels. Graca Machel is still in mourning. We wait. Parliament has also said he will not meet with this man, the one Monk that shakes a superpower called China. Olemic Thommessen would rather have China's blessing and the sales of Salmon fish to China rather than meet this 'Solomon' and have Norway sidelined by China. The Dalai Lama is scheduled to visit Oslo in May 2014. Doesn't the world need to see all these teams playing together in fact, in order to benefit China? Be sure the Popes are keen to have more Chinese converts as of any other group. In Easter the Catholic church prays for the conversion of everyone, everyone to the Catholic faith. But now again, if we emphasise differences and therefore the need for conversions what are we saying? Yes I know there is a tremendous inter church and other group dialogue always going on but what if we looked at what we share more in common than what divides us? There you go Nightbird idealising again? You by the way were already offended that Kenya's Moody Awori then Vice President would not allow the Dalai Lama to visit Kenya. He was denied a visa. Desnond Tutu has an infectious laugh! Heals! And that children could not see him do a simple thing like sing with Tutu and friends around many candles representing all peoples: Happy Birthday to you....! ...and if you come from my part of the world poke fun at where you were born too and laugh till your ribs crack when they tell you where you were born! Oops.. I better say barn! And of course it is clear that women are missing in all this leadership of the world and own paths. Perhaps they are busy writing stories, leading their nations but honestly Lema Bowie and Ellen Johnson Sirleaf the world still waits for your voices? Are you on Twitter ala @Pontifexs or WAZ UP? I heard more from you before you joined the Nobel Prize League! Come on LOML, let's have more COED! The International Criminal Court and Africa's future, Not I Lord, Surely? It wasn't me! Kirimi found tortured..Power in numbers.. solidarity in Kenya, we can! philoikonya. Awesome Inc. theme. Powered by Blogger.